April's Little Family: My Contortionist Baby. I have no excuse for being a naughty no-posting blogger. Except I'm tiiiiiiiired. And Casey has another cold. And there's not enough Purell in the world to save me from the rivers of snot I'm wading through. Ick. Ick is right, hope you stay nice and healthy and Carson gets better soon. And as for that picture, too cute!! Haha. If only I could be that flexible. oh big ick on the snot..........wash your hands! UGH. 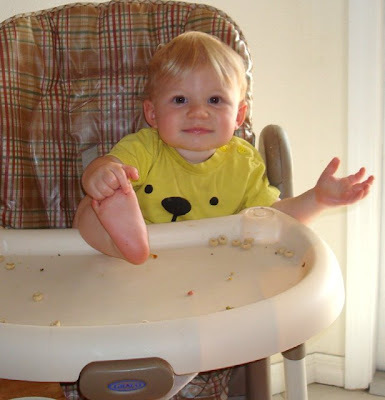 But your talented double jointed baby is so cute...........who cares that the big brother is a snot ball...LOL. Sending you immunity dust, lol! No more colds! I didn't know you guys got colds in FLORIDA! No excuses with that warm weather now! Ooooh...it looks pretty here! I like the new look!